Built for high-saline environments, the SwellSeal Swellable Packer from Nine swells faster and eliminates the need for fresh-water change out. Nine’s SwellSeal Swellable Packer swells twice as fast as our competitors, even in fully saturated brine. Fluid change out costs time and money, particularly in high-salinity environments. Our SwellSeal Swellable Packer is engineered to cut that time in half while enhancing operational efficiency in a range of applications. Rigorously tested to meet the highest performance and safety requirements, it delivers tailored deployment times, high swell volumes, exotic brine compatibility, and oil-water-combination elements. Our swell times are twice as fast as our competitors’, even in high-salinity fluids. In fact, while most swellable packers require replacing fluids with fresh water, ours swell in fully saturated brine. No need to haul and store fresh water or dispose of wellbore fluid. 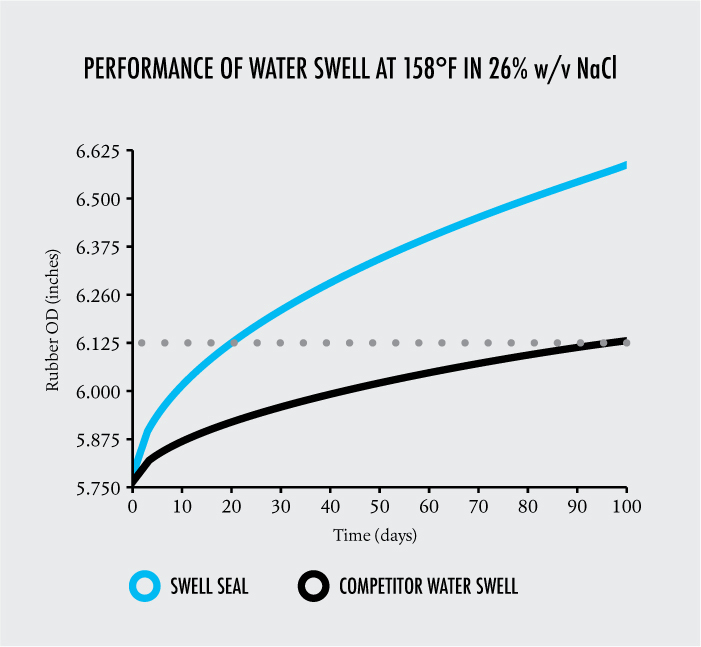 SwellSeal also provides stable performance in freshwater and oil-based fluids, with no loss of performance or final swell volume. As the first company with a high-salinity swellable packer in the Bakken, Nine customizes completion solutions to each project, backing those solutions with the tools and expertise you need to lower costs and enhance efficiency. Nine offers a full suite of completions solutions for the most challenging geology and the longest laterals. Will I need to use fresh water with the SwellSeal Swellable Packer? Because the SwellSeal Swellable Packer can perform in fully saturated brine, there is no need to haul or store fresh water for change out—or for that matter, disposing of wellbore fluid. This obviously saves considerable time on the rig. Is SwellSeal suitable for use in any environment? We’ve designed SwellSeal for use in a wide variety of applications under a range of operating conditions. It’s rated for fully saturated brine, fresh water, and oil-based fluids with no loss of performance or final swell volume. We also test it rigorously, establishing capability at up to 20,000 psi and 400°F. How reliable is the SwellSeal Packer? We know that meeting your performance and safety requirements are imperative. That’s why our testing process is rigorous, implemented in full scale, around-the-clock, whenever possible. We measure the seal in three separate locations every hour until the OD seal is achieved. We test the swell speed, pressure, and temperature, applying AWES OHZI recommended practices. Is this a standardized product? Every solution we offer is customized to the application, because each application has its unique set of challenges. Think of SwellSeal as a standardized innovation that can be customized to meet your needs. We offer different rubber compounds compatible with oil, water, and hybrid environments, as well as different temperatures, along with custom rubber diameters for various applications.